Diamond pendants are often constructed from various shaped and sized colorless diamonds, but pendants can offer so much more if they include some color from champagne diamonds for example. Also known as brown, cognac, and chocolate diamonds, champagne diamonds have grown immensely in popularity over the years, are sensational gems, and are wise purchases. Champagne diamonds can be placed in many different settings, similar to those of colorless diamonds. The difference is that there are so many more options with champagne diamonds, as they can be placed on their own, with colorless diamonds, as well as with other color diamonds and precious stones. There are many shapes that are available for champagne diamonds which offer an elegant look of luxury. Pave pendants offer a tremendous amount of options for champagne diamonds and leave much room for creativity. Here is a close look at some sensational champagne diamond pendants. One of the most popular pendant styles for champagne diamonds is the halo pendant. This look is achieved when a single stone is placed at the center and then surrounded by a row, or several rows of colorless diamonds. The middle stone can be one of many shapes and sizes from round to princess to heart to marquise. Colorless stones then surround the centerpiece stone, thus framing it and showcasing its full beauty. The colorless diamonds can go all the way up to the beginning of the necklaces chain or can just border the actual pendant. Another popular style is the multi-halo pendant look. Similar to the former style, this design takes it a step further with several stones hanging one after the other, each lined with colorless diamonds. This can also be done with the ”v” shape, with stones on either side of the pendant, and then a dangling pendant. Generally, the idea with color diamond pedants is to highlight the colors used in the jewelry. For example, a commonly used design is to place the colored diamond in the center and emphasizing the diamond with contrasting colors. However, if you are a fan of other colors, a wide range of color combinations is possible. The surrounding diamonds can be a mix of colorless and yellow, colorless and pink and so forth, and if we’re talking about a multi-stone hanging pendant, then the champagne stone can be one of several colors, which can include green, blue, and yellow diamonds. Champagne diamonds are very neutral and therefore go well with any color. Champagne diamonds can also be used together with other colors in the opposite way, with the champagne diamonds being the border diamonds and a colorless or other color diamond being the centerfold. When talking about the most suitable shapes for champagne diamonds it is hard to come up with one good answer. Truth be told, there are many options and they can all look phenomenal. It is up to your individual taste and budget, as well as the style you choose for the pendant, to determine the right shape. Since champagne diamonds are more on the subtle side in terms of color, it would be bolder to go with a shape that makes more of a statement such as the heart shape, marquise shape, or pear shape. It also is a matter of how many large stones you plan on including. If the amount exceeds one, it would be wise to choose a delicate shape such as round, radiant, or cushion. 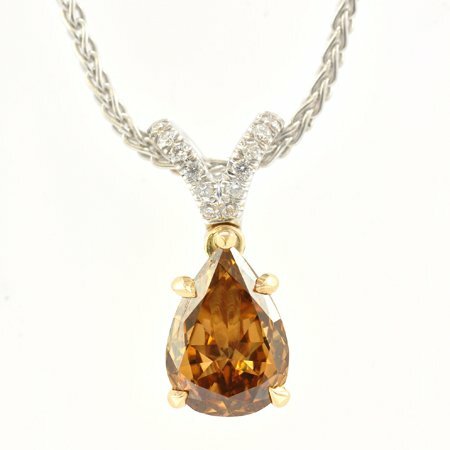 The category of champagne diamond pave pendants is a large one. This group refers to the placing of very small diamonds, whether all champagne, both champagne and colorless, or a combination of various color diamonds, very close together in such a way that the metal cannot be seen and a complete picture is created. This is especially of great importance if it is an image. Pave pendants can also be created with heart shapes, teardrop shapes, half moon shapes, as well as many others. 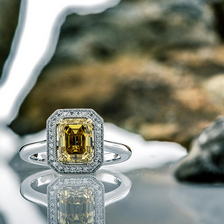 Colorless diamonds may be timeless, but times are quickly changing. 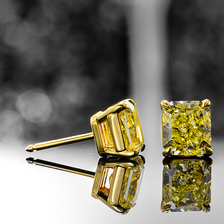 Color diamonds are rapidly replacing other stones and even metals for choices of jewelry as well as investment pieces. 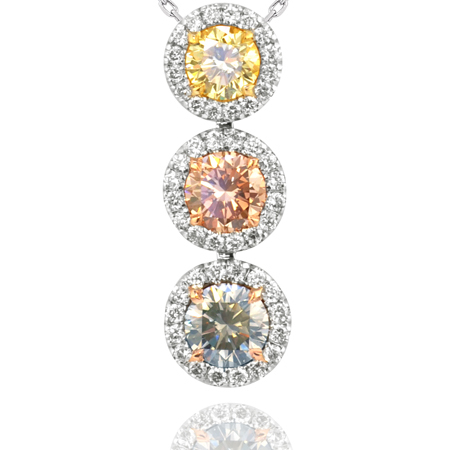 Champagne diamond pendants are the ideal fusion of timeless and durable stones with color, style, and high value. This way you can display Nature’s beautiful treasures and keep them close to you all at once.